It is hard to believe that Trumpophobic idiocy can plumb depths more profound than it has reached in the last few days. Just as the Russian-collusion argument, which was never supported by anything except Hillary Clinton's sulky evasions of her own responsibility for her electoral defeat, was sinking beneath the ripples the Trump-hating media had strenuously created for it, the Flynn indictment came. To anyone with any legal insight, such as Alan Dershowitz, Trey Gowdy, and Andy McCarthy (one of them should be the attorney general), it was the barefaced admission by Special Counsel Robert Mueller that, after nine months in charge of an investigation that had already been under way for eight months, he has absolutely nothing to justify continuing this charade within its original mandate to explore a Trump-Russian connection. Flynn was indicted for precisely the reason President Trump dismissed him as national-security adviser: lying about discussions with the Russians. The relief of the anti-Trumpers when the Flynn indictment gave them a lifeline to keep the impeachment dream alive in the minds of the fervent was inflated by ABC News's bulletin that Flynn had alleged that Trump had told him to contact the Russian government before the election. This in itself would not have been worrisome — anyone can speak to Russians if they want — but it led to window-rattling ululations of Trumpophobic joy. Typical of it was the action of semi-comedienne (about as humorous as Al Franken) Joy Behar (whose book, The Great Gasbag, is, surprisingly, not autobiographical): She burst into applause and generated a standing ovation from the studio audience of her daytime television program. But it was fake news: Flynn claimed nothing of the kind. The reporter who produced the story, Brian Ross, had previously been reprimanded for suggesting that a mass murderer in Colorado several years ago was a member of the Tea Party when there was no evidence for that; and, in 2001, he suggested that Saddam Hussein was behind anthrax attacks in the U.S. when there was no evidence for that, either. Last week he was forced to recant and to withdraw his story, and was suspended without pay for four weeks. Ms. Behar was left with one hand clapping. The president, as has been his custom for two years, vehemently attacked fake news, with accuracy and effect. He debunked CNN by Twitter, eliciting the righteous falsehood of the egregious Wolf Blitzer that that network had served truth to the world for "nearly four decades." Media solidarity fragmented on that whopper, as it was pointed out by several commentators that CNN had whitewashed Saddam, in order to maintain its bureau in Baghdad after other Western media had fled or been expelled by the Iraqi tyrant in 2003. Competitor Rupert Murdoch hit home when he claimed about 15 years ago that CNN's Havana correspondent was Fidel Castro. When the president tweeted on the weekend that Flynn had been fired for lying to the FBI as well as to the vice president, he succeeded in stirring up another hornets' nest of absurd confected outrage. Democratic senators Dianne Feinstein and Richard Blumenthal (the latter of whom had campaigned in 2010 referring to his service in Vietnam, a complete fabrication) torqued themselves up to agitation about a possible prosecution of the president for violating the Logan Act, and for obstruction of justice. The Logan Act of 1799, which prohibits private citizens from unauthorized attempts to conduct U.S. foreign policy, is nonsense constitutionally, and has never yielded a conviction or even been invoked since 1852. It does appear to have been a bugbear of official anti-Trumpism, having been bandied about for some time by many Democrats, including Nancy Pelosi and the beleaguered John Conyers. There has been some speculation that its potential violation was the pretext used by the Obama administration to conduct surveillance on the Trump campaign, an activity which, when revealed by Trump in March, led to much derision. It is a contemptible, nonsensical insinuation. No one officially complained when Senator Teddy Kennedy asked Soviet leader (and former KGB head) Yuri Andropov to join sensible Americans in opposing President Reagan's foreign and defense policy, or when former special prosecutor Archibald Cox wrote every government in the world asking them not to cooperate with President George H. W. Bush in the Gulf War in 1991. MSNBC's synchronized foamers-at-the-mouth, Joe Scarborough and Mika Brzezinski, tried to breathe new air into the flat tire of the 25th Amendment for replacing mentally and physically incompetent presidents. Launched on slightly sturdier legs was the claim that Trump had obstructed justice, because, if he knew that Flynn had lied to the FBI, his statement to Comey on January 27 that he hoped the FBI director would be able to avoid prosecuting Flynn was an attempt to obstruct justice, compounded by his subsequent dismissal of Comey. As Representative Gowdy explained in a television interview — having read all of Comey's memos over the period — if Comey had thought he was being tampered with by the president, he withheld that from himself (and Comey has publicly stated that he did not feel that). The anti-Trumpers have been engaged in a demeaning mousetrapping exercise for a very long time. The Justice Department (in the person of subsequently fired deputy attorney general Sally Yates) apparently asked to interview Flynn, and specifically asked him about conversations with the Russians, only to check his responses against what they had already ascertained from tapping into telephone conversations of the Russian ambassador, seeking a discrepancy. Flynn was so relaxed about it that he was not accompanied by a lawyer — unusual for someone who might be accused of treason — and he probably mistakenly forgot the conversations (as the attorney general, Jeff Sessions, claimed he did with the same ambassador). But Flynn pleaded guilty to lying as a single count, presumably to get rid of the expense and strain of Mueller's persecution in exchange for a shoestring to the special counsel to keep this sham investigation going. The Democratic retreat was impossible to disguise. Virginia senator Mark Warner, ranking Democrat on the Intelligence Committee, who nine months ago was claiming there were a thousand Russian agents planting anti-Clinton comments in swing states in the election campaign, and that Russia had won Wisconsin for Trump (complete falsehoods), and claimed until recently that the Steele dossier was "taken seriously by Britain, our ally," bumbled almost incoherently out of our television screens on the weekend about obstruction of justice. This must be the last trench of defense for this bedraggled cabal of myth-makers and slanderers. Allegations about Trump's tax returns, the infamous Clinton-commissioned Steele dossier, the whole collusion nonsense, and the 25th Amendment foolishness have all crumbled, and we are left with a statutory relic from John Adams and an obstruction scenario that Trump described persuasively as "more fake news about another Comey lie." This rubbish can't have been much consolation in a week when Trump got his tax bill through the Senate; the Supreme Court allowed his immigration executive order to proceed, pending determination of the main issue; it came to light that Mueller had had to fire an overt Trump-hater, Peter Strzok (who had helped push Comey into letting Hillary Clinton go unprosecuted for more serious lies to the FBI than Flynn committed); and Roy Moore regained the lead in the Alabama Senate election. 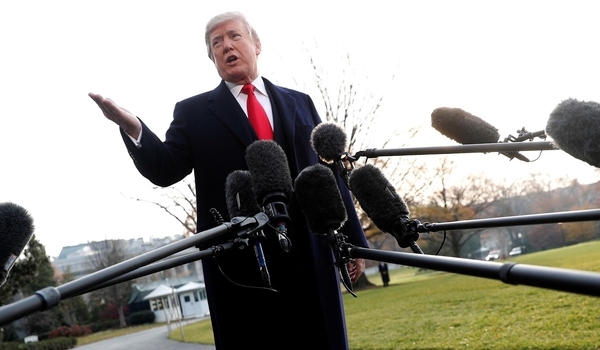 It is difficult to know whether President Trump deliberately pours gasoline on the fires of Democratic and conventional-media frustration with provocative tweets, or is just reckless; the most likely option is a combination of tactics and insouciance. His enemies almost always overreact and crunch their teeth into another nothingburger. He is clearly winning the long battle: Almost the entire congressional Republican caucus now accepts his leadership and is working to enact the Trump agenda that most of them opposed up to the election, and, as the tax bill shows, he is breaking through; the Democrats will shut the government down at their peril. But as he takes hold, the president should consider whether he doesn't owe the country and his great office a de-escalation of the tweet-wars. By all means, communicate with the vast Trump constituency and ignore the dishonest media — but he could graciously forgo answering the most insignificant critics (like the ungrateful father of the basketball player he sprang from prison in China) and throwing raw meat in the faces of the Maddows, Blitzers, and Scarboroughs, entertaining though it is. It is also time for the visceral snobs and deranged Trump-haters to subside and allow a serious opposition to arise, that offers alternatives and does not start swinging before the ball is pitched and strike out every time. America deserves a dignified chief and a loyal opposition.